The girls visit is slowly drawing to a close. I have to put them on a plane back to Germany on Thursday, where I'm sure their parents will be more than happy to see them after their ten day stay with me in England. Tomorrow evening we're all invited over for dinner at my friend J's house, so I only had to come up with one more kid-friendly recipe to keep them happy. We already had the usual spaghetti bolognese, chicken and chips, pizza and tacos, so I tried to get some inspiration by looking through some of my cookbooks. 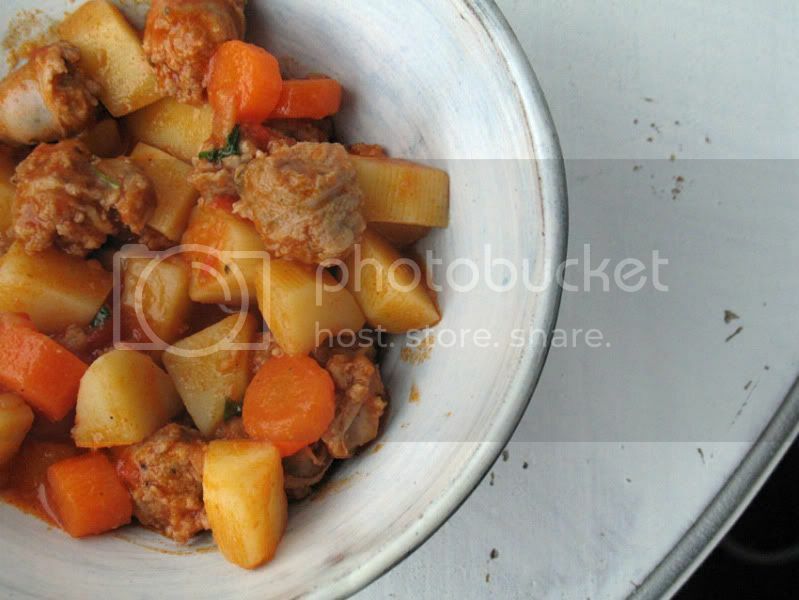 When flicking through Apples for Jam by Tessa Kiros, one of my favourite cookbooks, I came across this recipe for Sausage and Potato Goulash. I read it out to N and L and they both thought it sounded good, so off to the supermarket we went to buy the ingredients. I halved the recipe when I made it, but below you find it as it's printed in the book. I also added some carrots and used vegetable stock instead of water for extra flavour. The result was a hearty, rustic meal that was enjoyed by all three of us. In fact the kids asked if we could have it again tomorrow. That's what I call a result. Heat the oil and butter over medium heat in a large heavy based pan and fry the onion for a few minutes. Add the paprika, stir and fry for another minute, before adding the sausage. Fry the sausage until it begins to brown in places. Add the rest of the ingredients, apart from the parsley, stir, season with salt and pepper and bring to a boil. Reduce heat to a simmer and continue to cook for about 20 minutes, stirring occasionally to stop it from sticking. If the potatoes are not quite done after that time turn the heat off and continue to steam them by just leaving the lid on the pan until they are done. I love the picture you've taken, beautiful dish. Ginger, nothing to be ashamed of. I've got plenty of cookbooks that I've never used as well. Thanks for stopping by my blog - glad I came across yours too... You have the best blog name ever! Fancy swapping links? That is my absolute favourite cookbook of all time Sylvie. I've cooked lots out of it. Your dish looks fabulous! I am not surprised your little guests enjoyed it. I am sure they will miss your good cooking when they leave! I've heard good things about Tessa Kiros' books, this recipe looks gorgeous! 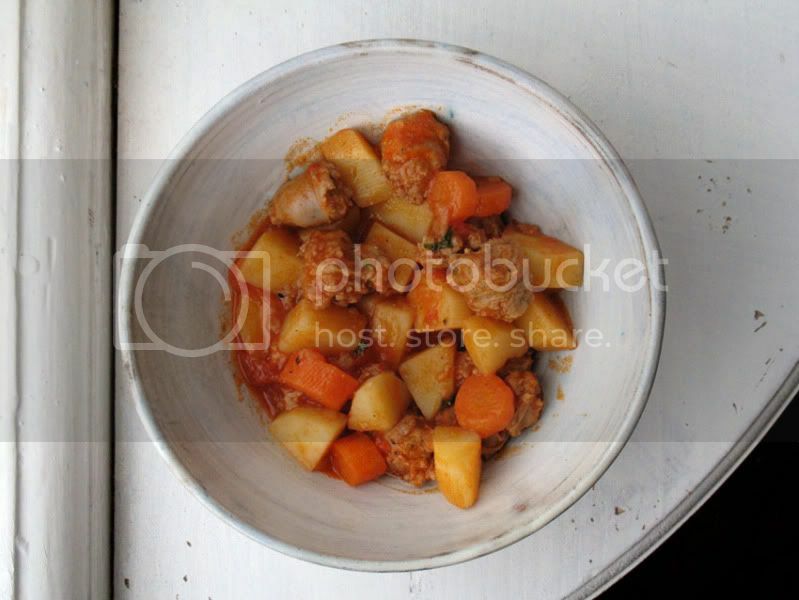 Great recipe and lovely photos Sylvie! Sounds like you had a great time with your young visitors Sylvie. That recipe sounds delicious!! MMMM that goulash looks delish, Sylvie! Great book and recipe. Looks delicious. This sounds tasty! I like the cinnamon in it for a hint of the exotic.